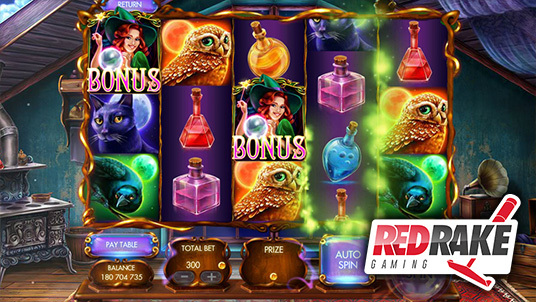 Red Rake Gaming has just released the slot machine Myrtle the Witch, a video slot machine with 5x3 reels with 30 betting lines. With this new slot machine, Red Rake Gaming, an online casino game developer company, specialising in top quality slot machines and Video Bingos, has now designed more than 50 slot machines. This new game has spectacular graphics and characteristics that make it one of the most entertaining slot machines for its intended audience. The mysterious GLASS BALL symbol reveals symbols while adding excitement to the result. The game also has the magic cauldron mini game where you can multiply the prizes obtained, as well as a free spins phase where Myrtle randomly turns symbols on the reels into the WILD SPELLBOOK symbol, increasing the possibility of bigger prizes.